UPDATE: With the release of EWG’s Tap Water Database, we found an additional 32 million Americans who have been supplied water with chromium-6 contamination. One of the most profound technological developments in the modern era was the implementation of mass public sanitation infrastructures and the subsequent availability of water free from feces and other biological contaminants. Indeed, this, along with improved nutrition and refrigeration technologies, was what was behind the widespread reduction in epidemic outbreaks in ‘infectitious diseases’ in the mid-tweintieth century and not the introduction of mass vaccination campaigns which came afterwards. Drinking unclean water can cause either acute or chronic effects, depending on the nature of the contaminant, and the concentration. Dysentery, a common water-borne bacterial infection, causes acute reactions such as intestinal inflammation, and severe diarrhea. A serious condition, dysentery causes rapid dehydration, and an infection which can be fatal, if left untreated. It is still a common third-world killer today. Done under the assertion that it helps prevent dental caries in underserved populations, this claim has been widely debunked in recent years. Authors of A Critical Review of the Physiological Effects of Ingested Fluoride, concluded that “Available evidence suggests that fluoride has a potential to cause major adverse human health problems, while having only a modest dental caries prevention effect.” These studies show that dental remineralization occurs when small amounts of fluoride are topically applied to teeth, not when ingested. Conventional wisdom dictates that people should consume at least eight 8-ounce glasses of water daily for good health, which makes sense in light of the fact that the human body is made up of about 75 percent water. But the importance of adequate water intake extends far beyond just avoiding dehydration as clean water may be perhaps the most important “nutrient”for effective detoxification and cancer prevention. From the perspective of healthy digestion, water is critical to keep things moving. It pushes food along through the intestinal tract while helping to keep the gut lubricated and flexible. Water also helps flush toxins from the digestive tract, preventing their buildup and any resultant disease, most notably cancer of the colon. Water also provides nourishment for the body’s cellular system, serving as a primary foundational component of the very structure of cells. Everything from body temperature to nutrient synthesis to toxin elimination to joint maintenance is regulated by cells, which absolutely must have optimal water intake in order to perform such duties in the interest of life. According to the United States Geological Survey (USGS), water creates saliva used for digestion, maintains proper membrane moisture levels, promotes the growth, survival, and reproduction of cells; flushes waste (mainly in the form of urine), and lubricates joints. It also aids in the manufacture of hormones and neurotransmitters in the brain, controls body temperature through sweating and respiration, protects the structural integrity of the brain and spinal cord, converts and breaks down food for nutrition, and delivers oxygen throughout the body. 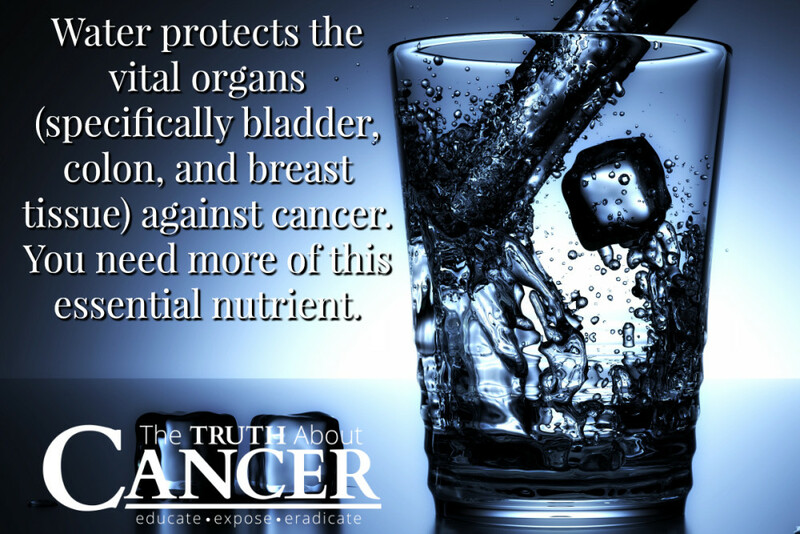 Water also helps protect the vital organs, specifically bladder, colon, and breast tissue, against cancer. 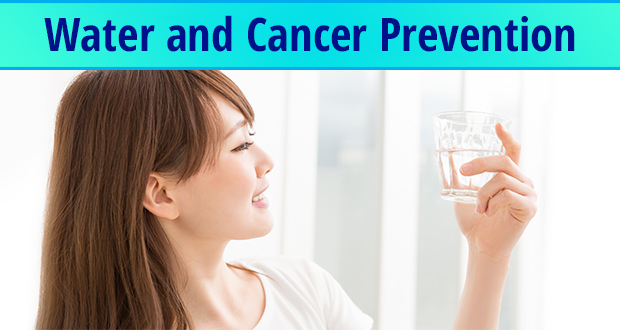 Research published in the Journal of Clinical Oncology reveals that water intake is inversely related to each of these types of cancer; meaning the more water a person drinks, the less likely he or she is to develop these potentially fatal conditions. Israeli researchers evaluated a series of studies looking at fluid intake in relation to cancer and discovered that maintaining optimal hydration is essential for thwarting this increasingly common disease. One study identified a statistically significant correlation between high fluid intake and decreased risk of bladder cancer among nearly 50,000 participants. Corresponding research identified elevated fluid intake as a detractor in the risk of adenocarcinoma of the colon in middle-aged men and women. Participants who drank at least five glasses of water daily were found to have a significantly reduced risk of colon cancer compared to those who drank two glasses of water or less daily. “This suggests that increased water intake may have an important role in reducing colon cancer risk by decreasing bowel transit time, reducing the mucosal contact with carcinogens, and decreasing the concentration of carcinogens,” reports the Journal of Clinical Oncology paper. Most people don’t realize that a deficiency in this key “nutrient” can cause so many ailments, including cancer. Are you drinking enough water, and doing so every day? Share this with friends to make sure they do! In April 2014, the state of Michigan took over management of the city of Flint, and as a cost-saving measure decided to switch the city’s water from treated Detroit Water and Sewerage Department water to water from the notoriously polluted Flint River. What followed was a human rights travesty. People started suffering health problems, including rashes, hair loss and vision problems, yet state managers insisted the water was safe. This stance was maintained even in the face of third-party independent water testing. In August 2015, Virginia Tech scientists led by Marc Edwards, Ph.D. discovered Flint’s tap water was contaminated with, in some cases, astronomically high levels of lead. “Incompetence, bureaucratic buck-passing, and environmental racism — Flint is majority African-American — and a catastrophic departure from democratic accountability in the one-eyed pursuit of reducing public budgets are the unsubtle culprits in this still-unfolding saga of mass poisoning. Lead is a well-recognized neurotoxin. Even the Romans in the second century B.C. understood its dangers. European countries began banning the use of lead in consumer goods in the early 1900s, yet the United States still to this day doesn’t take as firm a stance against it as we should. In fact, as noted by The New Yorker, while the League of Nations banned lead-based paint in 1922, the U.S. allowed its use for decades thereafter. Lead-based paint wasn’t banned in the U.S. until 1978. Even more egregious, the U.S. actually introduced leaded gasoline in 1923, and the ramifications of this greed-riddled move have had near-unfathomable repercussions for the global community. The auto and chemical industries used the same techniques back then as they do now; promoting, defending, manipulating government officials, and molding public opinion in order to profit from a toxic product, all while knowing exactly the kind of harm it causes. Non-toxic alternatives were readily available, but using lead allowed the oil industry to rake in higher profits. Human health was also traded for dollars in Flint. At most, the measure could save the city $5 million. But what was the ultimate cost to human health? Estimates suggest anywhere from 6,000 to 12,000 children in Flint may have been poisoned by lead, and the effects may reverberate throughout the rest of their lives. Flint is by no means an isolated incident. As noted in the featured article, Edwards also blew the whistle on lead-contaminated water in Washington, D.C. back in 2003. As in Flint, some of the lead levels in the water were high enough to be classified as hazardous waste, and as many as 42,000 children under the age of 2 may have been poisoned by lead-contaminated water in Washington DC between 2000 and 2004. As in Flint, the Environmental Protection Agency (EPA) was well aware of the contamination but kept it quiet. A water-quality manager who reported the problem to the agency was fired, and when Edwards began to bring the issue to the public’s attention, the EPA ended his contract with the agency. The Washington D.C. and Flint poisoning events reveal a baffling modus operandi of public health agencies. Instead of taking swift action to protect public health against the threat of lead poisoning, the problem is swept under the rug. The Centers for Disease Control and Prevention (CDC) was also in on the charade, producing a 2004 report that concluded the water-lead levels in Washington D.C. were of no major concern. This paper was subsequently used by cities across the U.S. to cut back on costly lead-abatement programs. While lack of accountability has and continues to be part of the problem, Flint residents may end up getting some measure of justice as three Michigan state and local officials are now facing criminal charges. According to the state Attorney General, that’s just the beginning. More charges may be brought as the investigation continues. On April 20, charges were brought against Michael Glasgow, a Flint employee, and Michigan Department of Environmental Quality (MDEQ) employees Stephen Busch and Michael Prysby. Glasgow faces up to five years in prison plus $6,000 in fines for evidence tampering and willful neglect of duty. Busch and Prysby are both charged with six counts of criminal activity, including misconduct in office, tampering with evidence, conspiracy, and violation of the Michigan Safe Drinking Water Act. If found guilty, they each face a prison sentence of up to 20 years, plus as much as $45,000 in fines. For everyone who is sick and tired of government corruption and wrongdoing, this is a ray of hope for change, as the threat of personal accountability and jail time may be the only deterrent strong enough to get officials to think twice about their actions. On the downside, the two state employees will receive state paid legal defense, which means the tax payers will be footing the bill. In related news, a judge recently also dismissed a class-action lawsuit by the residents of Flint. Today, lead contamination may be far more widespread than previously realized, as municipalities have dragged their feet when it comes to replacing old water pipes. Many are simply unaware there’s a problem with their water. For instance, while nearly 5 percent of children in Flint tested positive for elevated lead levels, 8.5 percent of children in Pennsylvania have elevated lead levels, as do 6.7 percent in parts of New York State, and 20 percent in Detroit. In the U.S. as a whole, more than half a million children between the ages of 1 and 5 suffer from lead poisoning. Many parents have been shocked to find out their children’s school serves up lead. According to a recent investigation, at least 350 schools and day care centers across the U.S. test above the EPA’s “action level” for lead content in water. One Maine elementary school tested 41 times above the action level, and a bathroom sink in Caroline Elementary School had a lead level of 5,000 ppb — the cutoff level at which the EPA considers it “toxic waste.” In Baltimore, schools have relied on bottled water for years due to elevated lead levels in the tap water. 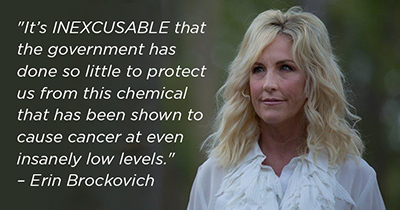 Chemical runoff from agriculture, industrial discharges, firefighting foam, mercury discharges from dental offices, water fluoridation, fracking operations, and toxic waste from concentrated animal feeding operations (CAFOs) also contribute to the water contamination problem. Old pipes can be replaced, thereby addressing lead contamination, but in order to address all of these other contaminants, more drastic changes are required. Preventing the chemicals from ever entering the water system is the only way to adequately address them, and that would require significant changes to entire industries. Is Your Water Contaminated With Lead? If there’s a silver lining to the Flint debacle, it’s that it has brought widespread attention to the issue of lead contamination across the country. Considering the faltering infrastructure, hundreds of U.S. cities with aging water lines are suspected of having an unacknowledged lead problem. John Oliver recently dedicated an entire episode to the lead issue in Flint and elsewhere, noting that a recent investigation found excessive lead levels in nearly 2,000 water systems across all 50 states. Moreover there are more than 7.3 million lead service lines across the country — any of which may be leaching lead into the drinking water. In addition to that, an estimated 24 million American homes still have lead-based paint on the walls. The cost to remediate all these buildings is high — $16.6 billion dollars a year for 10 years. Lead abatement programs receive a mere fraction of that. Last year, only 110 million was allocated to lead removal. However, while the expense may seem astronomical, research suggests that each dollar spent on lead paint abatement could result in anywhere from $17 to $221 in societal benefits such as lowered medical bills and reduced crime, which would make it money well spent over the long haul. Was your home built before 1978? If so, get it inspected to determine whether it has any lead paint. Lead paint removal should be done by a certified professional to ensure safety. The dust is highly toxic. For more information on this, see the EPA’s Lead-Based Paint Activities Professionals page. Get your water tested for lead. Be mindful of the fact that certain household objects may also contain lead. For information about lead-containing products and recalls, see the Consumer Products Safety Commission’s website. Get your child tested for lead. Ideally, all children should be tested at ages 1 and 2, and again at ages 3 and 4 if you live in an older home. It’s also recommended to test your child’s levels whenever there’s concern about exposure. A level of 5 or higher is considered dangerous. Even if you don’t have a problem with lead in your water, I strongly recommend filtering your tap water since most water sources are so severely polluted. In general, most water supplies contain a number of potentially hazardous contaminants, from fluoride, to drugs and disinfection byproducts (DBPs), just to name a few. Moreover, while there are legal limits on many of the contaminants permitted in municipal water supplies, more than half of the 300+ chemicals detected in U.S. drinking water are not regulated at all. Some of the legal limits may also be too lenient for safety. If you have well water, it would be prudent to have your water tested not only for lead but also arsenic and other contaminants. If you have public water, you can get local drinking water quality reports from the EPA. You can also check out the Environmental Working Group’s drinking water quality database, which covers 48,000 communities in the U.S. Among the top rated water utilities are in Arlington, Texas, Providence, Rhode Island, and Forth Worth, Texas. At the bottom of the list are Pensacola, Florida, Riverside, California, and Las Vegas, Nevada. Unless you can verify the purity of your water, I strongly recommend using a high quality water filtration system. To be certain you’re getting the purest water you can, filter the water both at the point of entry and at the point of use. This means filtering all the water that comes into the house, and then filtering again at the kitchen sink and shower. One of the best I’ve found so far is the Pure & Clear Whole House Water Filtration System, which uses a three-stage filtration process — a micron sediment pre-filter, a KDF water filter, and a high-grade carbon water filter — to filter out chlorine, DBPs, and other contaminants. Here’s a picture of what the setup looks like. (NaturalNews) The California Environmental Protection Agency’s Office of Environmental Health Hazard Assessment (OEHHA) recently released a document calledEvidence on the Carcinogenicity of Fluoride and Its Salts that highlights the many health hazards caused by the consumption of fluoride. And the Fluoride Action Network (FAN) recently submitted a compilation of its own to OEHHA, which is soon to make a final decision concerning fluoride’s toxicity, providing additional evidence that fluoride causes cancer. 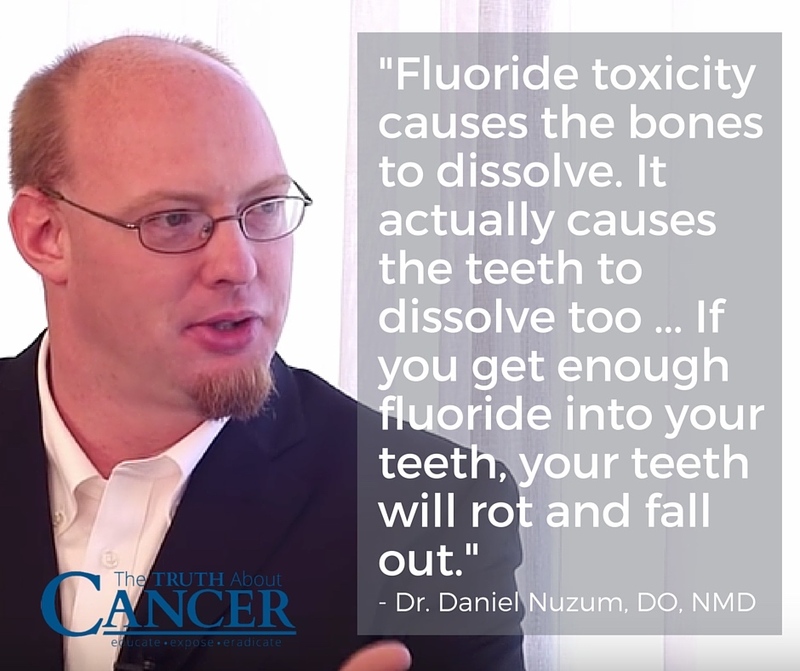 Dr. Daniel Nuzum: Fluoride toxicity causes the bones to dissolve. It actually causes the teeth to dissolve, believe it or not. Ty Bollinger: But isn’t fluoride supposed to be good for our teeth? Dr. Daniel Nuzum: That’s what they tell us. I don’t believe them, but that’s what they tell us. If you get enough fluoride into your teeth, your teeth will rot and fall out. Dr. Daniel Nuzum: That’s one of the toxic reactions to fluoride. That’s one of the signs of fluoride toxicity actually. Dr. Daniel Nuzum: Is rotten teeth. Ty Bollinger: Your teeth fall out. Dr. Daniel Nuzum: Right. Does the same thing with your bones. It rots your bones. It causes the bones to become soft and brittle. Ty Bollinger: Is that why—I read a study within the last couple of years that fluoride has been linked to osteosarcoma. That’s why? Dr. Daniel Nuzum: Yes, yes, absolutely. Dr. Daniel Nuzum: Absolutely, bone cancer. It weakens the bone. You know it weakens the teeth, weakens the jaw, weakens the bones. You know long bones, femurs… look at all the hip replacements that have to happen. We have weakened bones and they become harder and less flexible as we get older. They shouldn’t get more brittle. If we have a decent diet, we’re getting plenty of minerals and we mineralize our bones, they should become stiffer, not more brittle. Ty Bollinger: But almost inevitably in most elderly they’re brittle. I remember my grandma before she died. I think she broke her hip. Dr. Daniel Nuzum: Couldn’t even give her a hug? Ty Bollinger: She broke her hip one time just walking. Dr. Daniel Nuzum: Sure. Absolutely. Dr. Daniel Nuzum: Terribly brittle bones. We’ve been fluorinated in the United States for about 70 years, heavily fluorinated. And osteoporosis is rampant. It’s rampant in men, elderly men. Testosterone, which is our “boy hormone” should keep our bones strong. And despite that, the fluoride’s still eating away at our bones. Ty Bollinger: So you think that’s one of the major problems with the osteoporosis? Dr. Daniel Nuzum: I think so. Absolutely. Ty Bollinger: The fluoride, okay. In 1946, Everett Storey – a man called ‘a genius’ by Albert Einstein – was engaged in an exhaustive process of exploring the fundamental laws of matter. Storey was a physical chemist, microbiologist, publisher, and author. Storey was an expert in “Heavy Water” and in the uses of Deuterium, the non-radioactive isotope of Hydrogen. He worked on the American top-secret “Manhattan Project” and developed the triggering mechanism enabling the Hydrogen Bomb to exist. A Humanitarian and lover of life, Everett Storey vowed after the war to never again have anything to do with destruction of any kind. He made it a Statement of Policy of his laboratories. “There are to many human needs to be filled for us to waste our time and energies on negative pursuits”. After the war, Storey and his colleagues discovered a more personal crisis: they were dying of radiation poisoning, a result of their exposure while witnessing bomb tests. It was then that Storey developed the conceptual blueprint for Cellfood. He theorized that the very same water-splitting technology could be used to heal a human life. By utilizing hydrogen’s deuterium isotope, and a blend of the required trace minerals, enzymes and amino acids, he would create a solution— an ‘electromagnetic equation’— that could release vital oxygen and hydrogen into his bloodstream, remove toxic radiation, nourish and rebuild his systems, and return him to health. From this, he created CELLFOOD® (Deuterium Sulfate), a product he claimed was the key to any disease treatment in the world.Saved by his very own invention, Storey lived a long, healthful and productive life. And while Storey has been credited with many discoveries, his favorite achievement was designing a substance to heal the body and restore the environment; CELLFOOD®. Everett L. Storey’s formula has the unique ability to dissociate the water molecule into nascent Hydrogen and nascent Oxygen. This splitting of the water molecule results in the release of nascent Hydrogen and Oxygen gases simultaneously in a chain reaction that only involves about one five-hundred thousandth of the available moisture in the body at one time. This results in an additional source of Oxygen. Genius.In 1985, the United States Congress passed the DEUTERIUM FREEDOM ACT OF 1985, in which Storey was recognized for his amazing work and the development of CELLFOOD®. In 1995, CELLFOOD® was classified as a nutritional supplement and not as a drug or patented medicine.